Here we have a pair of Alpina backcountry Ski boots with NNN BC compatible rubber soles. We will respond to your query within 48 hours. New listingAlpina Doubleflex Swing 40 Ski/sunglasses. Size Small. Alpina Doubleflex Swing 40 Ski/sunglasses. Size Small.. Condition is Used in excellent condition. Dispatched with Royal Mail 2nd Class. The Challenge is one of the most successful ski goggles in the Alpina range. The Challenge S 2.0 QH version is especially well suited for skiers with narrow heads as well as harsh weather conditions. SKI GOGGLES IN BLUE SHADED TO GREY IN THE CENTRE, STYLE "SCOUT", FLEXIBLE & VENTILATED. THE BAND IS BLACK WITH ROYAL BLUE LOGO. THE ORANGE LENS IS "SINGLEFLEX FOG-STOP", BUT IS SCRATCHED. Airholes for breathable face ventilation. Alpina Scarabeo Qm Black Matt/lens:Qm Blue S2,L50 *Black/White (Black Dots). Condition is New. ALPINA Splinter Shield VL Glasses Red Fassung: Red-White; Gläser: Varioflex Black S2-3 Size:One Size. Outstanding price/performance ratio. Protection level S1-2,S2-3. 1 x Glasses. 2 COMP DESIGN. Boys Ski Trousers Black Age 8-9. Used only once so like new. From pet and smoke free home. Dispatched with Royal Mail 2nd Class. At this point the item will be re-listed. Can I collect the item?. In the unfortunate event that your order does not arrive GREAT GIFT FOR FAMILY AND FRIENDS WHO LIKE WINTER SPORTS. 40mm Power Strap. Plastic Liner Cuff. PU Heel & Toe Plates. Childs ski jacket in great clean condition. I also have padded trousers which we used as a match. Aged 11/12. THESE NAVY ALPINE SKI PANTS HAVE ELASTIC ON WAIST AND VELCO TO SIDE OF THEM.ZIP ON FRONT TO FASTERN.TWO SIDE POCKETS.PLUS TWO ZIP POCKETS ON SIDES OF LEGS.TWO BACK POCKETS.THESE ARE NAVY BUT PICTURES ARE MAKING THEM LOOK LIGHTER.LAYING THEM FLAT INSIDE LEG MEASURES APPOX 29" WAIST IS 26"/28".PLEASE FEEL FREE TO ASK ANY QUESTIONS.THANKYOU FOR LOOKING. ALPINA Doubleflex Ski / Snowboarding Goggles. Condition is Used. Dispatched with Royal Mail 2nd Class. With its Varioflex visor the JUMP JV VHM is suitable for use in all weathers. The lens adapts automatically to the lighting conditions.With its Varioflex visor the JUMP JV VHM is suitable for use in all weathers. Brilliant Goggles at a bargain price! Features Multi Mirror:- Shatterproof- 100% protection from UV A, B, C protection up to 400 nm. Double Flex / Multi Mirror lens - cat 3. Hi I’m selling a pair of Alpina child’s ski/snow goggles. These can be used in bad light overcast conditions and also on sunny days because I have a removable sun visor. Good for children from 6 up to the age of about 9 years old. Can be collected from Fulham Southwest London Or I can post. We got some true honest to goodness rear-entry boots from Alpina. The masses still ask for rear-entry boots, so Level Nine obliges. And there are good reasons why people still ask for rear entry boots, namely the fact that they open so large that you can slip these on easier than a pair of Vans. As far as skiing performance goes, this is a recreational cruiser boot. Anyone from a complete beginner to a pretty good skier who prefers to take it easy can find a happy home in this boot. NOTE: The sizing on these boots is a little different from other brands, please refer to the sizing chart on this page for correct sizing. 100% UV-A, B-, C-protection up to 400 nm. Disc Technology: Multimirror (MM) - highly mirrored, doubleflex thermal disc. HINGE BAND. Alpina 190cm cross-country ski with wooden soul and backcountry skis edges. We are here to serve you as the best way possible. Alpina ARRIS QH Quattroflex hIcon S2 black denim ski goggles for eyeglass wearers. Protection level S2. Ski Goggles, normal Visual AIDS can be worn in its spacious interior. Marke Alpina. Disclosure to third parties by plentyMarkets does not occur. 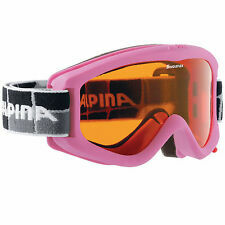 Adult ski glasses Alpina ski goggles Narkoja white HM orange S2. Soft face pads ensure maximum comfort, while the elastic, individually adjustable headband promises an excellent fit. High-quality goggles with high wearing comfort. The SCARABEO QMM model variant is equipped with high-end disc technology Quattroflex. The highly reflective glass is polarising and enhances contrasts. Skid grip prevents slipping of the glasses. Adult ski glasses Alpina ski goggles SCARABEO black matt QMM blue ch. Boots feature 4 micro-adjustable buckles and a high ankle strap for a precise fit. The removable, magnetic disc ensures clear visibility no matter whether in strong sunlight or under diffuse light conditions. She can be worn also over normal Visual AIDS (OTG). Base plate: Quattroflex S1. Infrared Protection Mirror - Maximum absorption of harmful infrared rays. Reflection of stray light and excess light. Color: black - MM disc S2 green mirror. Disc - Double FlexM ultiM irror, green mirror. Disc : Quattroflex, S1. Color: black. Fogstop Coating Protection against fogging. including transport bag (also serves as a cleaning cloth). Diamond Coating Increased scratch resistance, better visibility through clearer slices. The model SCARABEO is equipped with a heavily mirrored spherical washer MM, provides the 100% UV protection. Skid grip prevents slipping of the glasses. Available, the SCARABEO is MM in the design of the special series ChemicalCuisine. Alpina Ski Goggles Ski Goggles Pheos S Coldgreen mm Green Sph. The smaller PHEOS S MM with the Multi Mirror disk is available after PHEOS in nothing. Color: coldgreen. Marke Alpina. Glass color: Mirror black. USt-IdNr. : DE265369930. 36088 Hünfeld. Sports corner. The smaller PHEOS S QMM with the spherical Quattroflex Multimirror disc is the PHEOS in nothing. Marke Alpina. Color: black matt. Glass color: Red mirror. CUSHION SANDWICH FORM MARKED. They prevent an accumulation of heat and thus fogging of the glass. Alpina Cybric HM multicolor yellow ski goggles. Marke ALPINA. Wakeboard, water ski, fashion, Boardshorts, shorties, neoprene suits, glasses, ties, etc. - Disc: HYBRID MIRROR black spherical. Learn moreall products. Alpina adult ski goggles PAN Grandma MAGNETIC black red black matt Q / MM. The removable, magnetic disc ensures clear visibility no matter whether in strong sunlight or under diffuse light conditions.